Making the perfect cup of tea is something different for everyone. In general, the water quality, the quality of the tea, the proportion of tea leaves in relation to amount of water used and the time the water is in contact with the tea all play an important role in determining the flavor. Always use filtered water or mountain spring water. Unfiltered tap water contains chlorine and other minerals, which can affect the flavor of the tea. Try brewing a good amount of tea in a small amount of water and for a short time, allowing the tea to release its flavor slowly. This way, the tea will remain flavorful, even after ten infusions. Use 150 ml. (roughly 2/3 cup) of water per 8 grams (roughly 1/4 oz.) of tea leaves. It is recommended that you use a small Gongfu-style tea pot or a Piao-I tea cup with an inner pot. Many tea connoisseurs like to use "gaiwan," comprised of a cup with a lid and saucer, to brew Pu-erh tea. Before brewing, rinse the tea with boiling water twice and discard the water. The purpose of rinsing the tea are two fold: to rid the impurities in the tea and to loosen and expand the dry leaves, preparing the leaves to readily release the aroma and flavor of the tea. What is a good cup of tea often depends on personal preference. If you like it, then you have brewed a good cup of tea. The guideline below is meant to help you optimize the flavor of the tea. You can adjust the infusion time depending on the strength you prefer. The rule of thumb in tea brewing is to always decant the tea or remove the leave (if a tea bag is used) as soon as it is brewed to the proper strength. 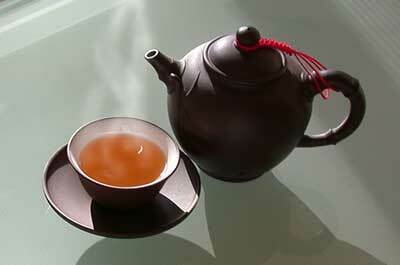 Pu-erh tea can be consumed by itself or mixed with other flower teas, such as rose, osmanthus or chrysanthemums. Flowers add a nice floral aroma and taste that makes the tea more interesting and enjoyable. You may also try mixing the Raw Pu-erh and the Ripe Pu-erh together. Mixing the two types of Pu-erh tea together can yield a smoothness and liveliness that neither tea can provide if consumed alone. I encourage you to try and experiment different combinations to make your tea drinking experience more interesting and rewarding. In the warmer months, some clients have even said they enjoy drinking Pu-erh chilled.